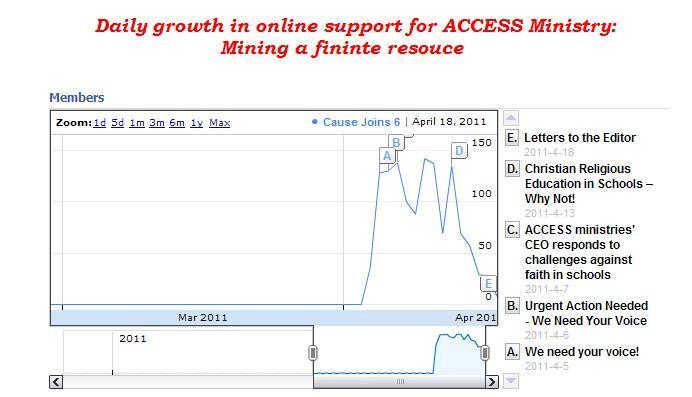 Has ACCESS mined out its online supporters? One day everything was quiet, ACCESS Ministry was busy with its annual awards banquet (approx 1500 guests), it had lobbied for a 50% increase in state funding to train and recruit new members to spread the gospel in our primary schools, Evonne had just launched a book about some frogs and a King and EVIL, a new graphic novel was launched slyly undercutting science and especially that bad man Darwin, even a new venture into publishing … and then all hell breaks loose, story after story in the age. Suddenly, there is water in the engine room and the unsinkable ship’s lights are shorting. TV crews are with the gaffer tape and tatoos are in the offices wanting to know what is going on, Father Bob has come out against this nonsense, even Barney Zwartz has called the game a TKO. You have to ask … what is the end game here? Are we going to have the same cycle of dishonesty and attacks that kept the P&C’s in NSW from getting the most modest concession to the policy or can we get on with doing the right thing for our schools and our children? Well the answer to that question is “ACCESS Ministry”. They make a lot of money off the status quo, over a million dollars in cartoon book sales alone. They have a large staff and board and big plans to “transform this Nation for God and his Son Jesus” … that toxic combination of politics, power and money never auger well for anyone. a drop from the peak that then follows a steep decline in the ability to reach new supporters. In other words, ACCESS Ministry has a finite base of support that they will flush out and scare into action, but then once the mine is played out … its done. The FIRIS cause on the other hand is just getting going – we lack the existing base of 4,000 volunteers, we don’t have 80 staff, we don’t have 12 Million Dollars. Martin Dixon doesn’t go on TV and tell us that the rules were designed to obligate anyone to do what we say … but that doesn’t bother us. We have gotten more letters than we can count, we’ve been deluged with support and well wishes and “where have you been” emails. In the end though, what matters is that we have principle and tradition on our side. Australians don’t want their schools run as venues for “Mission” by Christian Volunteers any more than they want door knockers or a subscription to “Watch Tower” thrust in their face. Parents just want their kids to get a good education and they want to be free to determine the religious identities of their family without ticking a box so some CRE lady who thinks the book of Revelation is a guide to the next decade … doesn’t have a go at their prep. If you are a politician, you should study that curve … you’re going to be asked to make a choice and even though the hare and the tortoise aren’t in the bible … everyone knows to whom the race belongs.